"Khatai" redirects here. For the village in Iran, see Khatai, Iran. Ismail I, (July 17, 1487 – May 23, 1524), known in Persian as Shāh Ismāʿil, (Persian: شاه اسماعیل‎‎; full name: Abū l-Muzaffar Isma'il bin Haydar as-Safavī; Azerbaijani: بیرینجی شاه اسماعیل; Şah İsmayıl Xətai), was Shah of Iran (Persia) (1501) and the founder of the Safavid dynasty which survived until 1736. Isma'il started his campaign in Iranian Azerbaijan in 1500 as the leader of the Safaviyya, a Twelver Shia militant religious order, and unified all of Iran by 1509. Born in Ardabil, Iran, he was the king (shah) of the Safavid dynasty from 1501 to 1524. The dynasty founded by Ismail I would rule for over two centuries, being one of the greatest Iranian empires (Persian empires) after the Muslim conquest of Persia and at its height being amongst the most powerful empires of its time, ruling all of Iran, Azerbaijan, Armenia, most of Georgia, the North Caucasus, Iraq, Kuwait, and Afghanistan, as well as parts of modern day Syria, Turkey, Pakistan, Uzbekistan, and Turkmenistan. It also reasserted the Iranian identity in large parts of Greater Iran. The legacy of the Safavid Empire was also the revival of Persia as an economic stronghold between East and West, the establishment of an efficient state and bureaucracy, its architectural innovations and its patronage for fine arts. Ismail played a key role in the rise of Twelver Islam; he converted Iran from Sunni to Shi'a Islam, importing religious authorities from the Levant. In Alevism, Ismail remains revered as a spiritual guide. Ismail was also a prolific poet who, under the pen name Khaṭāʾī (which means "sinner" in Persian) contributed greatly to the literary development of the Azerbaijani language. He also contributed to Persian literature, though few of his Persian writings survive. Ismail was born to Martha and Shaykh Haydar on July 17, 1487 in Ardabil. His father, Haydar, was the sheikh of the Safaviyya Sufi order and a direct descendant of its Kurdish founder, Safi-ad-din Ardabili (1252–1334). Ismail was the last in this line of hereditary Grand Masters of the order, prior to his ascent to a ruling dynasty. Ismail was a great-great grandson of Emperor Alexios IV of Trebizond and King Alexander I of Georgia. His mother Martha, better known as Halima Begum, was the daughter of Uzun Hasan by his Pontic Greek wife Theodora Megale Komnene, better known as Despina Khatun. Despina Khatun was the daughter of Emperor John IV of Trebizond. (She had married Uzun Hassan in a deal to protect the Greek Empire of Trebizond from the Ottomans.) Ismail grew up bilingual, speaking Persian and Azerbaijani. Not only did Ismail have Kurdish ancestors, but he also had ancestors from various other ethnic groups such as Azeri; the majority of scholars agree that his empire was an Iranian one. In 1488, the father of Ismail was killed in a battle at Derbent against the forces of the Shirvanshah Farrukh Yassar and his overlord, the Aq Qoyunlu, a Turkic tribal federation which controlled most of Iran. In 1494 the Aq Qoyunlu captured Ardabil, killing Ali Mirza Safavi (the eldest son of Haydar), and forcing the 7-year old Ismail to go into hiding in Gilan, where he received education under the guidance of scholars. When Ismail reached the age of 12, he came out of hiding and returned to Iranian Azerbaijan along with his followers. 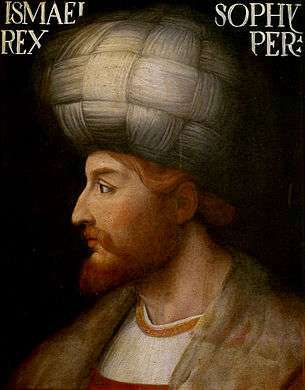 Ismail's rise to power was made possible by the Turkoman tribes of Anatolia and Azerbaijan, who formed the most important part of the Qizilbash movement. In the summer of 1500, about 7,000 Qizilbash troops, including members of the Ustaclu, Shamlu, Rumlu, Tekelu, Zhulkadir, Afshar, Qajar and Varsak tribes, responded to the invitation of Ismail in Erzincan. Qizilbash forces passed over the Kura River in December 1500, and marched towards the Shirvanshah's state. They defeated the forces of the Shirvanshah Farrukh Yassar near Cabanı (present-day Shamakhi Rayon, Azerbaijan) or at Gulistan (present-day Gülüstan, Goranboy, Nagorno-Karabakh), and subsequently went on to conquer Baku. Thus, Shirvan and its dependencies (up to southern Dagestan in the north) were now Ismail's. The Shirvanshah line nevertheless continued to rule Shirvan under Safavid suzerainty for some more years, until 1538, when, during the reign of Ismail's son, Tahmasp I (r. 1524-1576), from then on it came to be ruled by a Safavid governor. After the conquest, Ismail had Alexander I of Kakheti send his son Demetre to Shirvan to negotiate a peace agreement. By 1510, he had conquered the whole of Iran and Azerbaijan, southern Dagestan (with its important city of Derbent), Mesopotamia, Armenia, Khorasan, and Eastern Anatolia, and had made the Georgian kingdoms of Kartli and Kakheti his vassals. In the same year, Husayn Beg Shamlu lost his office as commander-in-chief in favor of a man of humble origins, Muhammad Beg Ustajlu. Ismail also appointed Najm-e Sani as the new vakil of the empire due to the death of Mas'ud Gilani. Ismail I moved against the Uzbeks. 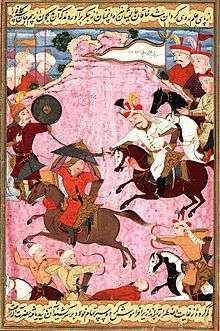 In battle near the city of Merv, some 17,000 Qizilbash warriors ambushed and defeated an Uzbek force numbering 28,000. The Uzbek ruler, Muhammad Shaybani, was caught and killed trying to escape the battle, and the shah had his skull made into a jewelled drinking goblet. In 1512, Najm-e Sani was killed during a clash with the Uzbeks, which made Ismail appoint Abd al-Baqi Yazdi as the new vakil of the empire. The active recruitment of support for the Safavid cause among the Turcoman tribes of Eastern Anatolia, among tribesmen who were Ottoman subjects, had inevitably placed the neighbouring Ottoman empire and the Safavid state on a collision course. As the Encyclopaedia Iranica states, "As orthodox or Sunni Muslims, the Ottomans had reason to view with alarm the progress of Shīʿī ideas in the territories under their control, but there was also a grave political danger that the Ṣafawīya, if allowed to extend its influence still further, might bring about the transfer of large areas in Asia Minor from Ottoman to Persian allegiance". By the early 1510s, Ismail's rapidly expansionist policies had made the Safavid border in Asia Minor shift even further west. In 1511, there was a widespread pro-Safavid rebellion in southern Anatolia by the Takkalu Qizilbash tribe, known as the Şahkulu Rebellion, and an Ottoman army that was sent in order to put down the rebellion down was defeated. A large-scale incursion into Eastern Anatolia by Safavid ghazis under Nūr-ʿAlī Ḵalīfa coincided with the accession of Sultan Selim I in 1512 to the Ottoman throne, and became the casus belli which led to Selim's decision to invade Safavid Iran two years later. Selim and Ismail had been exchanging a series of belligerent letters prior to the attack. While the Safavid forces were at Chaldiran and planning on how to confront the Ottomans, Muhammad Khan Ustajlu, who served as the governor of Diyabakir, and Nur-Ali Khalifa, a commander who knew how the Ottomans fought, proposed that they should attack as quickly as possible. This proposal was rejected by the powerful Qizilbash officer Durmish Khan Shamlu, who rudely said that Muhammad Khan Ustajlu was only interested in the province which he governed. The proposal was rejected by Ismail himself, who said; "I am not a caravan-thief; whatever is decreed by God, will occur." Ismail is also known for his poetry using the pen-name Khaṭā'ī (Arabic: خطائی‎‎ "Sinner"). He wrote in the Azerbaijani language, a Turkic language mutually intelligible with Turkish, and in the Persian language. He is considered an important figure in the literary history of Azerbaijani language and has left approximately 1400 verses in this language, which he chose to use for political reasons. Approximately 50 verses of his Persian poetry have also survived. According to Encyclopædia Iranica, "Ismail was a skillful poet who used prevalent themes and images in lyric and didactic-religious poetry with ease and some degree of originality". He was also deeply influenced by the Persian literary tradition of Iran, particularly by the Shahnameh of Ferdowsi, which probably explains the fact that he named all of his sons after Shahnameh-characters. Dickson and Welch suggest that Ismail's "Shāhnāmaye Shāhī" was intended as a present to his young son Tahmasp. After defeating Muhammad Shaybani's Uzbeks, Ismail asked Hatefi, a famous poet from Jam (Khorasan), to write a Shahnameh-like epic about his victories and his newly established dynasty. 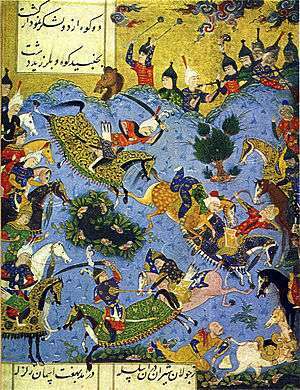 Although the epic was left unfinished, it was an example of mathnawis in the heroic style of the Shahnameh written later on for the Safavid kings. Along with the poet Imadaddin Nasimi, Khatā'ī is considered to be among the first proponents of using a simpler Azeri language in verse that would appeal to a broader audience. His work is most popular in Azerbaijan, as well as among the Bektashis of Turkey. There is a large body of Alevi and Bektashi poetry that has been attributed to him. The major impact of his religious writings, in the long run, was the conversion of Persia from Sunni to Shia Islam. In the Safavid period, the famous Azeri folk romance Shah Ismail emerged. According to Azerbaijani literaty critic Hamid Arasly, this dastan is related to Ismail I. But it is also possible that it is dedicated to Ismail II. Metro, District and Facility in Azerbaijan. A street in Ganja and Prospect in Baku. 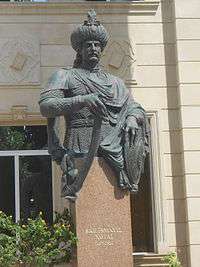 In 1993, a monument to Ismail I was erected in Baku. A sculpture was erected in Khachmaz (city) to Ismail I. 1 2 Woodbridge Bingham, Hilary Conroy, Frank William Iklé, A History of Asia: Formations of Civilizations, From Antiquity to 1600, and Bacon, 1974, p. 116. 1 2 Helen Chapin Metz. Iran, a Country study. 1989. University of Michigan, p. 313. 1 2 Emory C. Bogle. Islam: Origin and Belief. University of Texas Press. 1989, p. 145. 1 2 Stanford Jay Shaw. History of the Ottoman Empire. Cambridge University Press. 1977, p. 77. 1 2 Andrew J. Newman, Safavid Iran: Rebirth of a Persian Empire, IB Tauris (March 30, 2006). 1 2 3 "ESMĀʿĪL I ṢAFAWĪ – Encyclopaedia Iranica". iranicaonline.org. Retrieved 2014-10-15. ↑ Savory 1997, p. 8. ↑ Roger M. Savory. "Safavids" in Peter Burke, Irfan Habib, Halil Inalci:»History of Humanity-Scientific and Cultural Development: From the Sixteenth to the Eighteenth Century", Taylor & Francis. 1999. Excerpt from pg 259:"Доказательства, имеющиеся в настоящее время, приводят к уверенности, что семья Сефевидов имеет местное иранское происхождение, а не тюркское, как это иногда утверждают. Скорее всего, семья возникла в Персидском Курдистане, а затем перебралась в Азербайджан, где ассимилировалась с говорящими по-тюркски азерийцами, и в конечном итоге поселились в маленьком городе Ардебиль где-то в одиннадцатом веке [Evidence available at the present time leads to the conviction that the Safavid family came from indigenous Iranian stock, and not from Turkish ancestry as it is sometimes claimed. It is probable that the family originated in Persian Kurdistan, and later moved to Azerbaijan, where it became assimilated to Turkic-speaking Azeris and eventually settled in the small town of Ardabil sometime during the eleventh century.]". ↑ Вопрос о языке, на котором говорил шах Исмаил, не идентичен вопросу о его «расе» или «национальности». Его происхождение было смешанным: одна из его бабушек была греческая принцесса Комнина. Хинц приходит к выводу, что кровь в его жилах была главным образом, не тюркской. Уже его сын шах Тахмасп начал избавляться от своих туркменских преторианцев. [The question of the language used by Shah Ismail is not identical with that of his race or of his "nationality". His ancestry was mixed: one of his grandmothers was a Greek Comnena princess. Hinz, Aufstieg, 74, comes to the conclusion that the blood in his veins was chiefly non-Turkish. Already, his son Shah Tahmasp began to get rid of his Turcoman praetorians.] — V. Minorsky, "The Poetry of Shah Ismail I," Bulletin of the School of Oriental and African Studies, University of London 10/4 (1942): 1006–53. 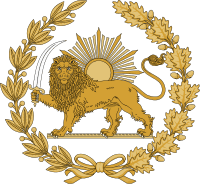 ↑ "Peoples of Iran" Encyclopædia Iranica. RN Frye. The Azeri Turks are Shiʿites and were founders of the Safavid dynasty. ↑ Encyclopædia Iranica. R. N. Frye. Peoples of Iran. ↑ Roy 2014, p. 44. 1 2 3 Sicker 2000, p. 187. ↑ Fisher et al. 1986, pp. 212, 245. 1 2 3 Rayfield 2013, p. 164. ↑ Bosworth & Savory 1989, pp. 969-971. ↑ Savory 2007, p. 36. ↑ Newman 2008, p. 16. 1 2 Savory 2007, p. 50. ↑ Savory 1998, pp. 628-636. ↑ Savory 2007, p. 37. ↑ "History of Iran:Safavid Empire 1502 - 1736". Retrieved 16 December 2014. ↑ Eraly, Abraham (17 September 2007). Emperors Of The Peacock Throne: The Saga of the Great Moghuls. Penguin Books Limited. p. 25. ISBN 978-93-5118-093-7. ↑ Soucek 1982, pp. 105-106. 1 2 Savory 2007, p. 41. ↑ Savory, R. (2007). Iran Under the Safavids. Cambridge University Press. p. 43. ISBN 9780521042512. Retrieved 2014-10-15. ↑ Mikaberidze 2015, p. 242. ↑ Momen (1985), p. 107. ↑ Savory 2007, p. 47. 1 2 "ESMĀʿĪL I ṢAFAWĪ – Encyclopaedia Iranica". iranicaonline.org. Retrieved 2014-10-15. 1 2 V. Minorsky, "The Poetry of Shah Ismail I," Bulletin of the School of Oriental and African Studies, University of London 10/4 (1942): 1006–53. ↑ M.B. Dickson and S.C. Welch, The Houghton Shahnameh, 2 vols. (Cambridge, Mass., and London, 1981. See p. 34 of vol. I). 1 2 H. Javadi and K. Burrill. Azerbaijan. Azeri Literature in Iran. — Encyclopædia Iranica, 1998. — Vol. III. — P. 251-255. ↑ Newman 2008, p. 13. 1 2 Roemer 1986, p. 211. ↑ Sakina Berengian. Azeri and Persian literary works in twentieth century Iranian Azerbaijan. — Berlin: Klaus Schwarz Verlag, 1988. — С. 20. — 238 с. — ISBN 9783922968696. It was also during the Safavid period that the famous Azeri folk romances — Shah Esmail, Asli-Karam, Ashiq Gharib, Koroghli, which are all considered bridges between local dialects and the classical language — were created and in time penetrated into Ottoman, Uzbek, and Persian literatures. The fact that some of these lyrical and epic romances are in prose may be regarded as another distinctive feature of Azeri compared to Ottoman and Chaghatay literatures. ↑ "Опера "Шах Исмаил"". citylife.az. ↑ Э. Г. Абасова. Магомаев А. М. Музыкальная энциклопедия. — М.: Советская энциклопедия, Советский композитор. Под ред. Ю. В. Келдыша. 1973—1982. Wikimedia Commons has media related to Shah Ismail I.